Tim Berglund will discuss how the commitment to distributed computing affects software architecture. We'll explore what happens with storage, computation, and coordination between servers in a distributed system. Distributed programming is different in almost every way from traditional, single-master programming, and in this webcast, we'll get an idea how those differences play out and what open-source products are current meeting the needs of the marketplace. 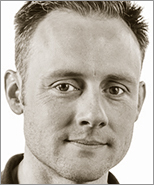 Tim is a teacher, author, and technology leader with DataStax, where he serves as the Director of Training. He can frequently be found speaking at conferences in the United States and all over the world. He is the co-presenter of various O'Reilly training videos on topics ranging from Git to Mac OS X Productivity Tips to Apache Cassandra, and is the author of Gradle Beyond the Basics. He tweets as @tlberglund, blogs very occasionally at http://timberglund.com, and lives in Littleton, CO, USA with the wife of his youth and their youngest child.